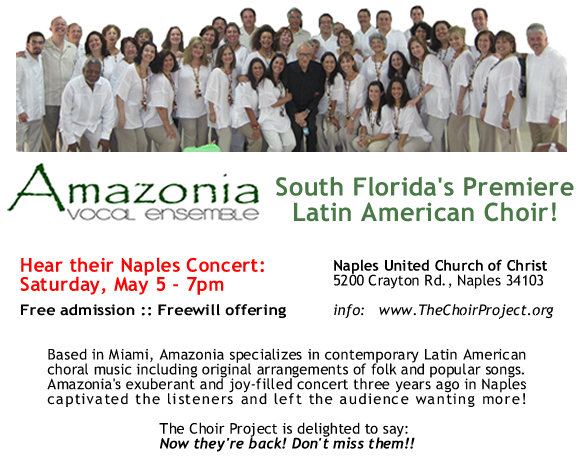 Amazonia – Latin American Choral Concert! Here, their performance of “La Cotorrita” by Afro-Peruvian composer Nicomedes Santa Cruz (arr. V. Chavarr?a). Southwest Florida friends are warmly invited to join us for a choral celebration of Advent: “Lumina… Light!” This concert images the Advent season of ‘light in the darkness’ through choral music by American and international composers, poetry by Ann Weems and Susan Palo Cherwien, and personal stories of international Advent and Christmas traditions from Spain, Germany, Russia and The Philippines as told by local Naples friends. The Lumina women’s vocal ensemble, conducted by Dr. Marian Dolan, will be joined by pianist Kelly Utterback, guitarist Mario Arnez, actor/narrator Betsy Klopp Bennett, and other special guests. Maybe even an appearance by Sancta Lucia from Sweden! And, as is traditional in Choir Project concerts, the audience will sing, too! This concert is sponsored and hosted by the Music Department of Naples United Church of Christ. We are honored by and deeply appreciate their invitation and hospitality. 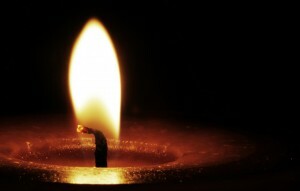 The candle image is courtesy of Noah Urban and Noah Urban Photography. May 16-17, 2009 – Amazonia! The rhythm of Latin American choral music! The Choir Project's mission is "to build community chorally." This concert is free. No tickets are needed.